Earlier this year, Disney confirmed plans for a fifth Indiana Jones movie. While rumours had previously suggested that they might recast the lead role, the producers decided to keep Harrison Ford for the sequel. After they see this new audition tape, however, they're going to desperately regret their decision. 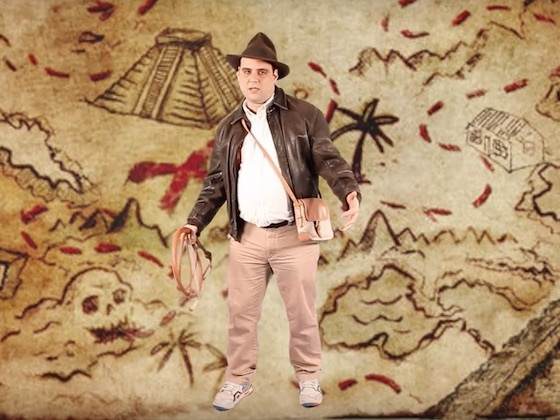 While some people once thought Chris Pratt was ideal to play Indy, a new sizzle reel proves that the best man for the job is in fact Toronto comedian Chris Locke. In the three minute clip below, Locke urges Steven Spielberg to consider him for the lead role instead. And he has a point — no one else can say "throw me the boy" quite like him. Watch Chris Locke's audition below. The new Indiana Jones movie doesn't arrive until July 19, 2019, so there's still plenty of time to fly Locke down to L.A. and make this official.